After the 2015 whale expedition season, when faced with high travel costs and a lack of time to dedicate to studying whales, we began thinking of ways to alleviate these issues for future expeditions. We also wanted to reduce our carbon footprint and create less waste. The solution… a tiny house! When looking for a way to begin building our tiny home, we partnered with Atlas Roofing to help source some of the necessary supplies. When you think of Atlas Roofing, you don’t typically think of whale expeditions and wildlife biologists, however this summer may change all of that. Starting in June, we will begin our expedition to study several of the thirteen different whale and dolphin species in the Gulf of St. Lawrence. With the help of many sponsors, including Atlas Roofing, we were able to build an environmentally sound tiny home that will serve as our mobile research base. It will assist in our expedition by saving us time and money and will keep our own carbon footprint to a minimum. Once we determined that the Atlas products met all of our qualifications (including being energy efficient and manufactured sustainably! ), we chose the Atlas EnergyShield® Pro foam boards for both the walls and the roof of the house. The boards feature a high R-value and Class A durable aluminum facer that also serve as a water resistive barrier—all very helpful qualities for our tiny house. We will soon be embarking on our 670-mile journey along the eastern coast of Canada. 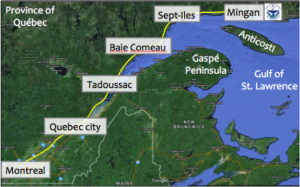 Our journey will begin in Montreal and we will track the whales to Mingan, in the Gulf of St. Lawrence. Along the way, we will be making several stops in order to promote environmental awareness and living small. Over the next few months, we will update our blog on how the expedition is going. To continue to follow our journey and learn more about the tiny house, please check back!